Manufactured from biodegradable resins sourced from reclaimed castor oil. Manufactured from biodegradable resins sourced from reclaimed castor oil, Costa’s newest frames withstand the elements of adventure while also providing comfort and wearability. Featuring Costa’s new innovative sweat management system, the new styles have ventilation ducting allowing air to flow through the end piece of the frame, which reduces lens fogging and works in conjunction with the sweat management temple channels. These channels enable airflow from the vents to cool, wick away and drain sweat and moisture through the openings on the temple tips. In addition, a thinned out inner bottom eyewire tucks closely into the back surface of the lens, which allows sweat and moisture to drain down the back surface of the lens and off the bottom of the frame. Costa’s Cape in Matte Black Ultra with Gray Silver Mirror 580P lens. The Cape is an extra-large frame that offers massive lenses and ultra-wide temples to provide the most protection from the sun’s harmful rays. The open ventilation ports and Hydrolite® nose and temple pads help manage perspiration and heat while preventing slippage, and the flexible temples provide all day comfort—helping anglers make the most of their time on the water. The Cape frame is available in matte black ultra, shiny steel gray metallic, bowfin and matte russet, with 580 polycarbonate lenses in seven different lens colors, including Sunrise Silver Mirror or Gray Silver Mirror. The new frame can also be customized with prescription lenses. Costa’s Montauk in Steel Gray Metallic with Green Mirror 580G lens. The Montauk, named after the iconic fishing village at “the end” of Long Island, is a large full-wrap, highly ventilated frame designed to block peripheral light and manage sweat. The Hydrolite nose and temple pads ensure a secure fit, and are keeper-ready—making it practically impossible to lose them when the sun goes down. The Montauk frames are available in matte black ultra, steel gray metallic and bowfin, with 580 glass or polycarbonate lenses in all seven lens colors, and are also available with prescription lenses. The new frames feature Costa’s patented 580 lens technology, providing 100 percent UV protection and polarization to give anglers the clearest lenses on the planet. The Costa 580® color-enhancing lens technology selectively filters out harsh yellow light for superior contrast and definition and absorbs high-energy blue light to cut haze and enhance sharpness. 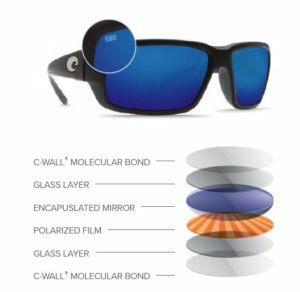 In addition, Costa’s lens technology reduces glare and eye fatigue. 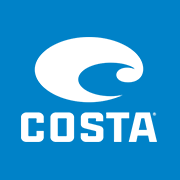 Costa’s lenses are available in both polycarbonate and scratch-resistant Lightwave® glass, which are 20 percent thinner and 22 percent lighter than average polarized glass. The new styles range in price from $179 to $259, based on lens selection. For more information on the new frames and Costa’s full line of performance sunglasses, visit www.costadelmar.com. More about Costa on BD.